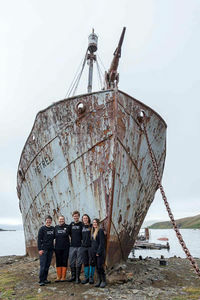 February has been another eventful month for the team down at Grytviken. We started with a visit from the cruise ship Prinsendam which, with over 650 passengers, is the largest vessel to have visited South Georgia Museum in a decade. Locals from the BAS station and a visiting group of whale scientist helped us out both with operating the museum and with fundraising on the ship as with only five on our team we would otherwise have been a bit shorthanded. Everyone really enjoyed getting involved and making the visit such a success. Between the busy ship schedule, the team has managed to make great progress with work in the museum. Many new objects have gone on display for the first time, including a chess set made of whale tooth, which belonged to an ex-manager of Leith Harbour Whaling Station. Our annual program of deep cleaning the museum exhibits has also been moving forward, most recently focussing on the key ‘Shackleton’ artefacts in the collection, such as his personal walking stick and a sledging compass used on the Nimrod expedition (1907-09). The team has been working closely with the GSGSSI builders again this month, predominantly on re-displaying the museum’s new model of Endurance which we received at the end of 2018. The builders have constructed a beautiful new base for the model, providing it with greater stability and allowing it to be centrally displayed in the Fullerton Room. The model now fits in well with the rest of the Shackleton story and helps to bring the amazing story of the Imperial trans-Antarctic Expedition (1914-17) to life. As well as helping us in the museum, the GSGSSI builders managed to reinstate Shackleton’s memorial cross at Hope Point this month. After rebuilding the cairn, the new replica cross was unveiled on the evening of Shackleton’s birthday, 15th February. It was a beautiful evening and everyone in the community gathered at Hope Point for dinner and drinks to commemorate ‘the Boss’. The original cross, which is now too fragile to live outside, will enter the museum collection. Shackleton’s birthday has been one of many local events and activities that the museum team has enjoyed taking part in throughout February. We were able to assist with the scientific work of the British Antarctic Survey on a number of occasions. Our museum assistant Kerstin helped with this month’s fur seal pup weighing. She joined a team of around twelve, spending the day on the beaches and in the tussac grass at Maiviken, weighing 100 fur seal pups. Later in the month, Dani (Fundraising Assistant) and Laura (Museum Assistant) headed out with a group, led by the BAS Higher Predator Scientist, to undertake the weighing of gentoo penguins. They really enjoyed getting involved and we always love being able to help the great work of the British Antarctic Survey down on the island. Another local event that the whole museum team took part in was the annual ‘South Georgia Extreme Half-Marathon’. This is always a brilliant day out for everyone and the course includes 850m of incline running, with ascents to the top of Brown Mountain and Deadman’s Cairn in Bore Valley. Some of the museum team acted as marshals on the route and the others put on their running shoes. The day ended with a big community barbeque at King Edward Point… and a few sore legs in the morning! On a slightly sadder note, we were all very sorry to see one of our team leave us at the end of the month. Kerstin, who was spending her 2nd year with South Georgia Museum, headed off on National Georaphic Explorer, where she will be spending the end of the tourist season as a member of the expedition crew on board. Thankfully it wasn’t a final farewell as she will be coming back to visit us on the ship in March. Fortunately, before Kerstin left, we managed to make use of her fantastic photography skills and get our annual team photo taken. We wish Kerstin all the best and can’t wait to see her again in a few weeks. February has been another busy and exciting month for the South Georgia Museum team and we can’t believe we are already into March – our last month on the island! We will soon begin to prepare the museum for winter and start planning for the next season (2019-2020). The time really is flying. This page was last modified 14:12, 18 March 2019. This page has been accessed 327 times.